The Pedlar has a fabulous weekend vibe, full of life an energy on a rainy day. Sticking to my ‘order the most unusual thing on the menu’ philosophy, I was very excited to see that they offer Pan-seared Sardines on their weekend brunch menu. Sadly, they were out, so I made do with the Fried Duck Egg ($18) with sweet corn fritters, whipped goat’s curd and roasted tomatoes, plus a fresh orange juice ($6.50). The juice came out quickly and was a good size, although it did have a lot of ice in it. 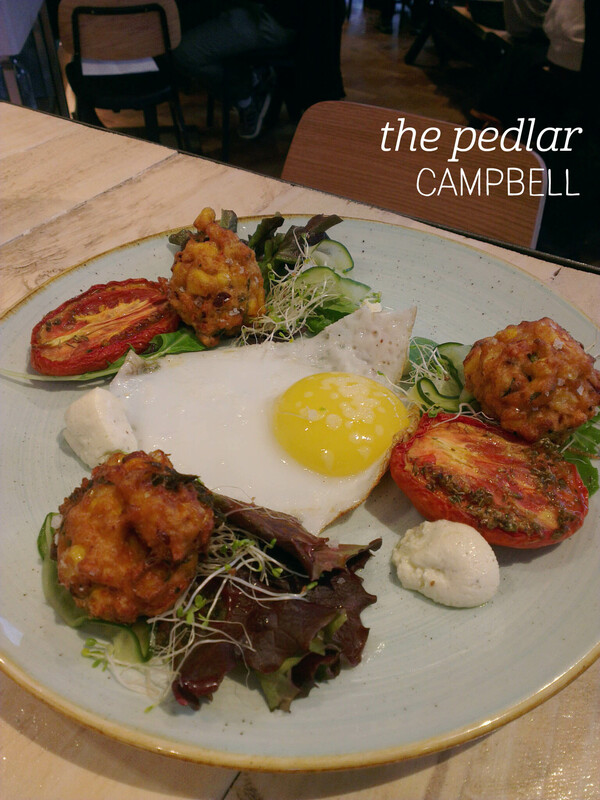 Brunch was beautifully presented, with the huge fried egg in the centre and three clusters of fritters, tomatoes and greens around it. My first thought was that I would have liked some bread of some sort to mop up the perfectly runny yolk with – it had a surprisingly salty tang, which boosted the flavour overall. The fritters were also well-seasoned, and had just the right balance to avoid being dry or soggy, and went perfectly with the very tasty goat’s curd. The tomatoes were a nice touch too, and I left feeling well-fed. The staff were really friendly and welcoming – I’m looking forward to trying the sardines next time! On an unexpectedly warm autumn day, I found myself craving juice. I always enjoy stopping in at Pressed Juices, with their pretty display fridge and fun, fresh flavours. I hadn’t tried any of their new autumn menu, so the lady kindly allowed me to sample a couple of flavours. The Pink Lemonade had a really zesty flavour, with a strong buzz of lemon and ginger overlaying the strawberry flavour, which I really enjoyed. But I was sucked in my the ingredients list for the Antiox 2 ($9.50) – hello orange, raspberry, pomegranate and tumeric! Orange and raspberry and two of my favourite flavours, and, really, who can go past pomegranate? I took this juice home and devoured it pretty quickly – the serve was two full glasses. The citrus zest of the orange is smoothed out nicely by the tartness of the raspberry and pomegranate, making a surprisingly even flavour profile. The tumeric was hard to split out, but I think it definitely contributed to the well-rounded flavour of the juice. I love the freshness of the juices here – there’s nothing artificial, so you need to drink them within a couple of days of purchase (if you can wait that long!). Once again, Pressed has impressed. Hey Jupiter has been on my to visit list for ages – I finally got there! It was a busy weekday afternoon, and I managed to snag a seat at the two-seater bar. The waitress was really helpful and got me a watermelon, apple and mint juice ($7.50) to kick things off – it came in a gorgeous flask and whilst much darker in colour than what I would expect from fresh watermelon, it was tasty and refreshing. 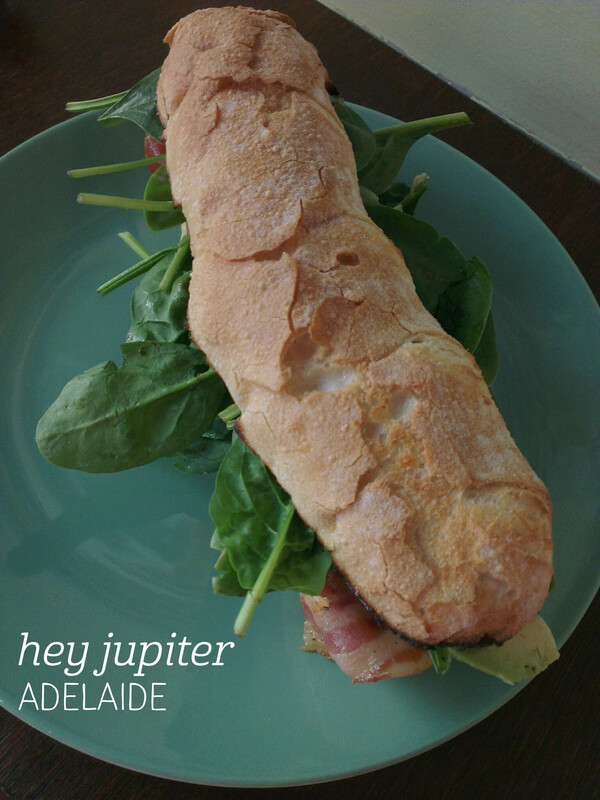 Now, normally I’m not a sandwich kind of girl, but sandwiches seem to be Hey Jupiter’s forte, so I gave them the benefit of the doubt and ordered the pancetta sandwich ($13). Holy moly. That is one damn fine sandwich. The ingredients are top quality, from the crispy, long bread to the salty, paper-thin pancetta, and boy does it show in the flavour. The lemon-thyme mayonnaise is something rather special, and paired with the generous serving of avocado, there’s a lovely creaminess that cuts through the salt of the pancetta. The baby spinach leaves are really packed in, and I left with both taste buds and hungry stomach satisfied. Not to mention the friendly staff who are clearly adored by their regulars, making me wish I was still a local. I know I’m a bit slow jumping on the Space Kitchen bandwagon, but let’s just spend a moment appreciating what a beautiful bandwagon this is. Located on the ground floor of Skypark, Space brings together industrial and urban chic, with a dose of Ricardo’s desserts thrown in for good measure. I couldn’t go past a fresh juice, so started with the orange, pear, pineapple and passionfruit combo ($6.9), which was beautifully balanced and sweet. To eat, I picked the super-Instagrammable (that’s totally a word) Space Benedict. Now don’t imagine your classic eggs benedict people, this is something on a whole other level. 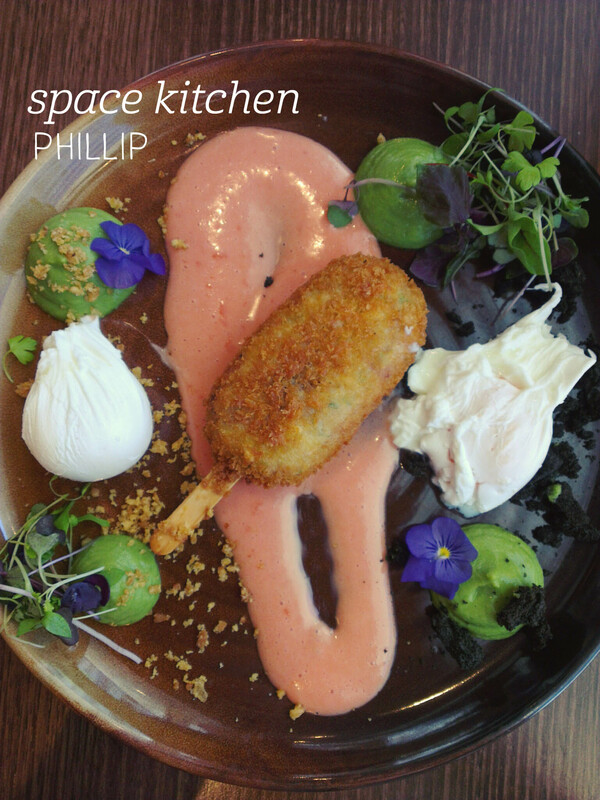 Obviously the presentation is to die for – Space sets the bar high, and the taste doesn’t disappoint. The perfectly poached eggs oozed out over the plate, mixing with the beetroot hollandaise to make a perfect sauce for the crumbed pork croquette that makes up the majority of the dish. Whilst rich, the pork is lovely and tender and has a great amount of flavour on its own, let alone with the hollandaise or pea puree, not to mention the addd textural elements of a crumbled brioche mixed with pork crackling. My only suggestion would be something else to help mop up all those saucy elements – otherwise, I’ll be back again soon! 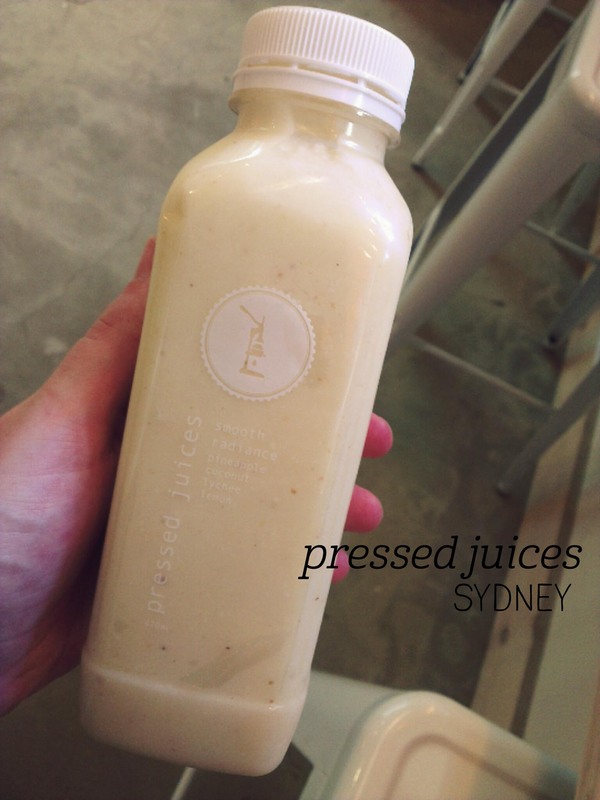 I know I’ve blogged about Pressed Juices before, but they have such a fun range that I couldn’t help myself. This time I wandered past one of their Sydney stores, and was determined to try something different. I hadn’t had any of their ‘green’ juices, and the lady kindly offered me a couple of samples to try, but while I was sipping on those, my eye was caught by one of their smoothies. I double checked – yes, dairy-free – and went for it on an impulse. It was, luckily, a great choice. The texture was like a slightly runny smoothie, although surprisingly thick for a cold press containing nothing but fruit. The four ingredients – pineapple, coconut, lychee and lemon (yes, they were the only ingredients in the whole thing) – were really well balanced. The pineapple and lemon were the most distinct flavours, but neither was overly sharp and the coconut made the overall flavour a bit creamy. I also really liked the ‘bits’ of pineapple and coconut left in the smoothie, which enhanced the texture, although I imagine could be offputting for anyone not a fan of pulp. So, two for two on the Pressed menu. I have an incredibly awesome group of friends who will make pretty much any excuse to catch up – luckily breakfast is often that excuse. We gathered at Double Shot on a weekday morning – I started out with an apple, orange, pineapple and mint juice ($7), which was served in quite a large jar and was nicely balanced between the ingredients – there’s nothing like a fresh juice to start the day! 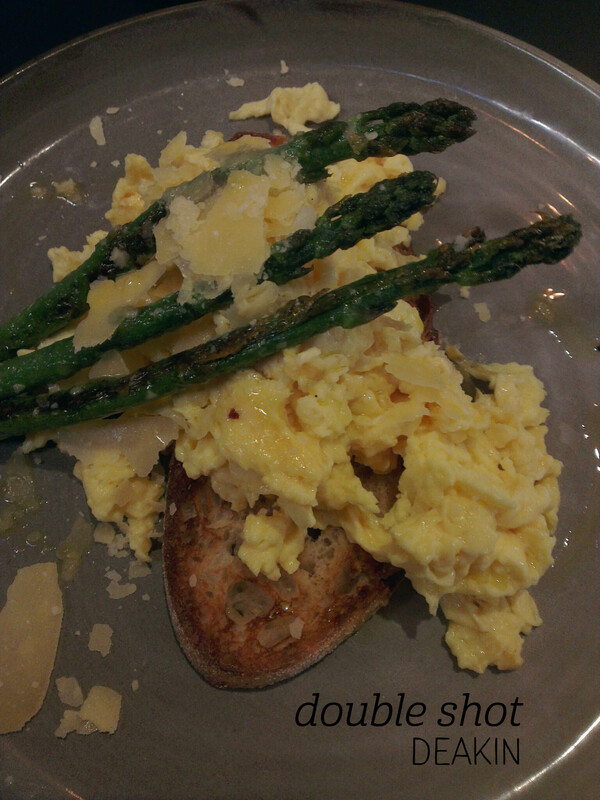 I’d tried the mushroom dish before, so this time I went for the scrambled eggs with pecorino, grilled asparagus and truffle oil ($19). Our food was brought out mostly together (a short wait in between the first and last person to be served), and I felt like the presentation was a bit slap-dash, as though the ingredients had just been tossed on the plate, but I guess it’s hard to make scrambled eggs pretty! The asparagus was perfectly cooked and went perfectly with the fluffy, creamy eggs. The pecorino added a great bite to the dish (I liked that it wasn’t all melted into the eggs), and the truffle oil was in there working its magic. The toast was a bit too crispy for me, but other than that it was a lovely meal, both food and company-wise. 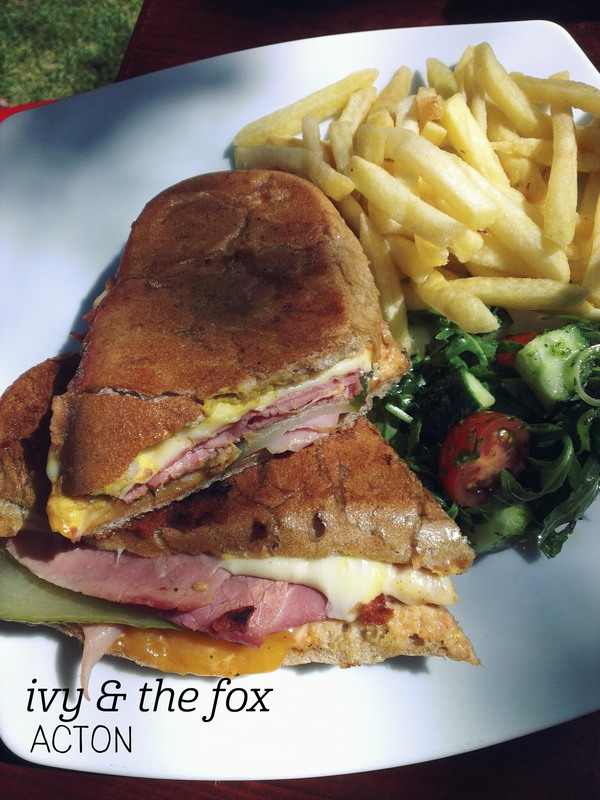 As a big fan of Fox and Bow, I was very excited to try their new store, Ivy & The Fox, at ANU. Mum and I picked a table out on the lawns in dappled sunlight. We started with drinks – I picked the El Macho, a pineapple and pear juice with lemon, cinnamon, vanilla and nopal cactus. Take the time to mix this up – on first sip, all I got was cactus, cinnamon and vanilla, but once blended with the pineapple it was a beautifully balanced juice. To eat I picked the Reuben Gonzales, with house corned silverside, pickles, mustard, swiss cheese and fries – the portion was massive! The silverside was cut very thin, which is quite different to what I would have expected, and the mustard and cheese added a lot of flavour. I appreciated the bit of salad on the side, and whilst the fries were nice, I found them a bit underdone, but I prefer mine on the crispy side. Mum loved both her Oh Darla and Road Runner. The location was second to none – with glimpses of the lake all around and just the right amount of sun and shade, I can see myself spending plenty of time here.